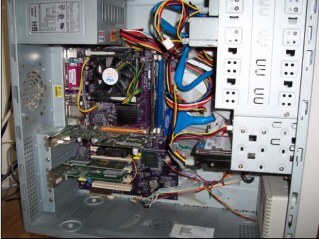 Besides the LCD monitor, a DVD drive, and a few stickers on the case I've added over the years; there has been very little change in the outward appearence of my computer from what it originally was. 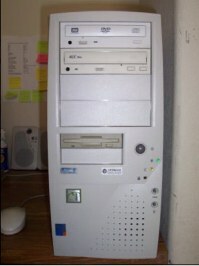 The same Superpower Zephyr KS201XP case which contained my Pentium III and Celeron rig now houses my current Pentium 4 system. 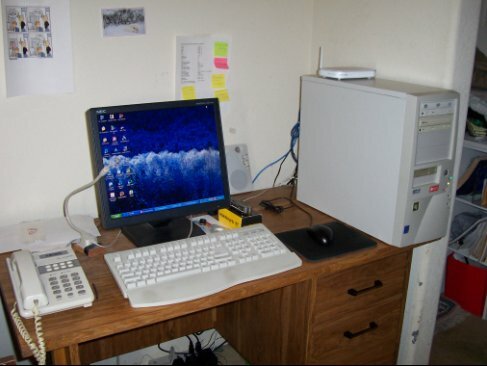 This computer is where I do most of the work on my webpages, photo or video editing, animations, internet access, and occasional games. 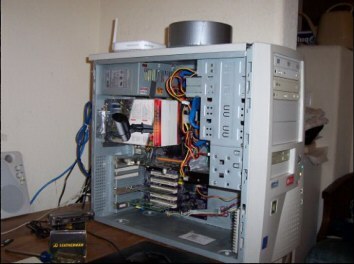 I built this computer myself after my Celeron overclocking experiment resulted in a "meltdown." My new mother board normally costs around $50.00 but I got it for free from a friend. It is an 848P-A by Elitegroup Computing Systems. Not the best P4 board avaliable from what I've read in reviews but it worked for me. 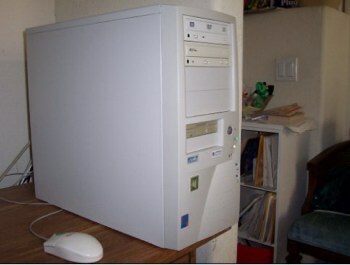 I bought the 2.4ghz Pentium 4 with Hyper Threading and a 512gb stick of PQI ram from Fry's Electronics and used what I already had in the case for building a new computer (pretty much an upgrade). Powered up the first time with no problems. My only issue was that my friend forgot to give me the CD that had the drivers for the onboard sound card which was normally packaged with the motherboard. I had to download a 20meg file from ECS with my 56k modem. Plus a generic (no name) keyboard, Logitech Optical mouse, microphone, and a no name set of speakers that actually sound very good. Besides overclocking the P4 to run at 2.6 instead of the normal 2.4 (The 848P-A allows you to adjust the system bus frequency in the BIOS), my only upgrades to this system was to replace the stock Intel heatsink packaged with the processor with a Vantec Aeroflow VP4-C7040. It brought my CPU temperature from 40EC to 36EC at idle. I also replaced the noisy Sunon fans with Panasonic fans that I bought from Casecoolers. I made an air duct out of small cardboard box (for a solar garden light) to draw cool air from an unused fan vent directly to the CPU fan. It looked "ghetto" (well, you won't see it with the case closed since I don't have windows on the side) but it help bring the temp down 3EC than just having the CPU fan pick up warm air around that area. The drawback of this was that extra colume of air in the "duct" amplified the noise produced by the CPU fan and directed out the back of the case where it echoed off the wall. It got a little annoying so I recently removed it. My next upgrade may be to increase the 512mb of PQI ram to 1gig. I may also upgrade my graphics card to a Radeon 9800. I currently have a Radeon 9200 which I got when I still had my old motherboard since it was the only card I found that would still work with the older 2X AGP slots.